Riverdale is a large area in the east end of Toronto that encompasses many smaller neighbourhoods. In the broadest sense, Riverdale runs from the Don Valley Parkway east to Pape Avenue, and south from Danforth Avenue to Gerrard Avenue......READ MORE! South Riverdale is located in the south-east part of Toronto and is bounded by The Don Valley to the west, and Greenwood to the East, and lies south of Gerrard. It is also commonly referred to as Leslieville/Riverside. The original homes of the 1880s were modest in nature; styles include Ontario Cottage, Second Empire row houses, and Victorians........READ MORE! 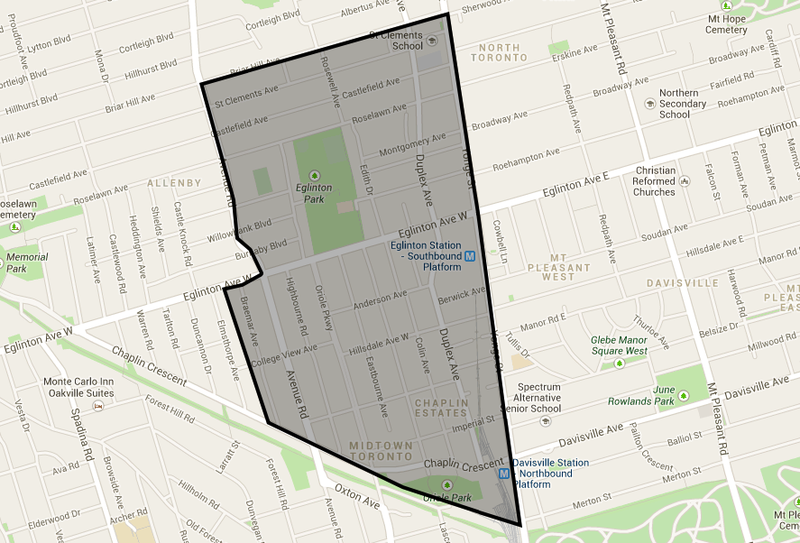 The City of Toronto recognizes this area as two separate communities, but the reality is that local residents refer to it simply as Davisville Village and while it is divided almost perfectly by Mount Pleasant Road, it is often overlooked for better-known neighbourhoods like Leaside to the east and Chaplin Estates to the west.....READ MORE! Located in the centre of the city lies the quiet neighbourhood of Leaside. This leafy area, first settled in the mid 1800's, is one of the city's premier areas for upper middle class families who value this established and safe community as the perfect place to raise their families......READ MORE! The City of Toronto recognizes this area as two separate communities, but the reality is that local residents refer to it simply as Davisville Village and while it is divided almost perfectly by Mount Pleasant Road, it is often overlooked for better-known neighbourhoods like Leaside.....READ MORE! Yonge and Eglinton, once a part of the old Town of North Toronto, is also affectionately known as “Yonge and Eligible” thanks to the 20-something crowds that settled into the low and high-rise apartment buildings in the 70’s and 80’s. Today that moniker is more about lifestyle than age......READ MORE! Also known affectionately as Deer Park, thanks to the great number of deer that lived in the area at the turn of the century, the Yonge - St. Clair neighbourhood is bounded by a section of the Rosedale ravine to the east, Farnham Avenue and Jackes Avenue in the south, Avenue Road and Oriole Parkway in the west, the Belt Line trail in the north.....READ MORE! 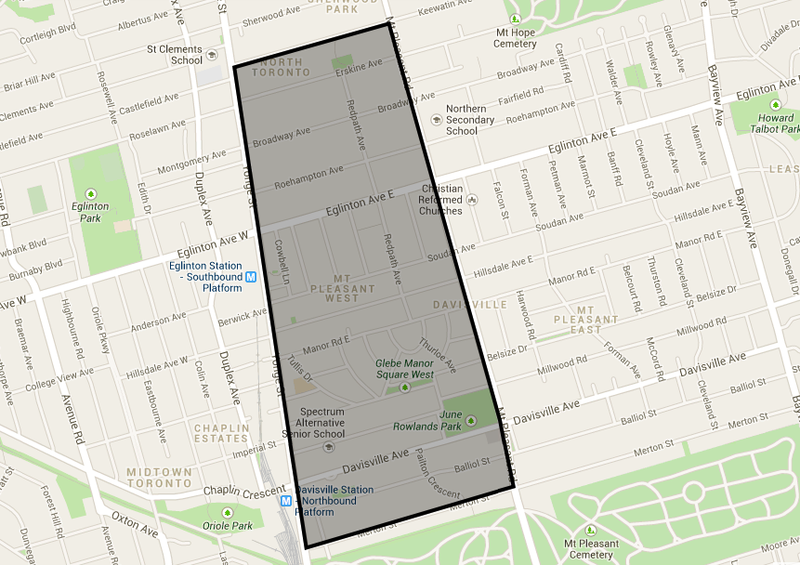 It is generally assumed that the dividing line between Moore Park to the north and Rosedale to the south is the railway tracks that bisect this large central neighbourhood. Indeed, this is an area with many natural barriers. To the north is the Mount Pleasant Cemetery, to the south is the Park Drive Ravine and the railway tracks.....READ MORE! The Annex, bounded by Dupont Street to the north, south to Bloor Street, west to Bathurst Street and east to Avenue Road also includes the neighbourhoods of Seaton Village, parts of Koreatown and Yorkville. The Annex became part of Toronto in the late 1800s and immediately became one of Toronto's elite neighbourhoods mostly because the large red brick homes.......READ MORE! Danforth is a thriving, primarily Greek neighbourhood filled with residences and plentiful cafes, restaurants and bars. 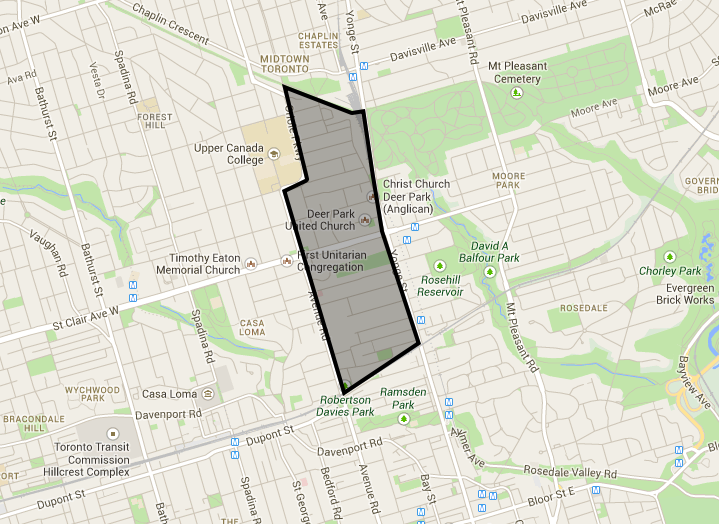 Pape in the west to Woodbine in the east, from Danforth Avenue up to just north of Milverton Boulevard.......READ MORE! Bounded on the west by Lansdowne Avenue, on the north by College Street, on the east by Ossington Avenue and on the south by the Canadian Pacific Railway and Canadian National Railway CNR/CPR mainline railway tracks. The area west of Dufferin Street was a part of the former Town of Brockton.....READ MORE!